By Philip Taylor · Filed Under: Credit Cards · November 28, 2018 · · Part-Time Money is supported by you. When you sign-up for services or buy something through links below, we may earn an affiliate commission. Learn more about how we make money. If you’re like me, you’ve dabbled into the award travel game and found yourself with a wallet – or a desk drawer – full of credit cards; many of which you aren’t using anymore. This might have left you feeling disorganized, uneasy, and worried about making a mistake. If you’re not careful, you could end up with a bunch of annual fees for cards your not using or worse, an account could get compromised and you end up with a bunch of fraudulent charges. That’s no good. occasionally conduct an audit of your credit card situation. I tend to like the 2nd approach (I use AwardWallet.com but not obsessively) and will usually just conduct an annual audit. In fact, I just audited my own suite of credit cards and so I thought I’d share with you my process for identifying my cards, making cancel or “downgrade” decisions, and what new cards I’m considering applying for. I feel like doing this has helped me to simplify my financial life, optimize my credit score, and future-proof my award travel opportunities. Everyone has different approaches to this so I’m linking to other helpful resources that you might find useful. If you’re not quite into travel rewards then you might not have faced this issue yet. If you want to learn how to get into this rewarding – albeit time-consuming – endeavor then I suggest you check out these posts on the subject. It should always be mentioned: never carry a balance on a card, pay them off in full each month, and avoid unwanted annual fees like the plague. All of these things kill your odds at making award travel a worthwhile pursuit anyway. To get started with your audit it’s important to identify all of your credit card accounts. You may have misplaced a card or two through the years and forgot about accounts. There are several ways to find all of your accounts. Start with what’s in your wallet. “What’s in your wallet?” Heh! List each card in your wallet into a spreadsheet or in a card tracking service like this one from AwardWallet.com. On the sheet, you could add columns for issuer, card name, open date, expiration date, owner (if tracking for both you and your spouse), credit limit (log into your online account or call the issue to find this info), annual fee, and any relevant notes about rewards. List out all of the information that’s going to be helpful for you to make decisions. 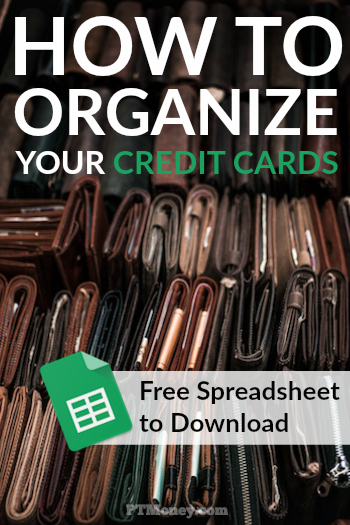 Once you work through the cards in your wallet, go to your safe, financial files, junk drawer, old purses, or wherever you keep those other cards and add them to the sheet. Finally, pull a free credit report and cross-reference your list. See a card on your report that’s not listed? Great! Add it in. If a card on your list isn’t listed on your report, make a note of that as well so you can get that added to your report. I created my own simple sheet. Here’s the sheet as I initially filled it in (before I made any decisions). If you’d like to download this spreadsheet just click here and create a copy to work with. Want something a little more robust? Check out what Johnny Africa created. Taking Action With Your Annual Review: Cancel, Downgrade, or Keep? Once you are confident in your inventory of cards it’s time to make some decisions. Should you keep all of the cards? Cancel some and close the account? How do you decide? 1. I keep my oldest 2 cards active even if I’m barely using them. My oldest cards give my credit history a longer file and help with my score. I usually keep these cards around and have a Netflix type of charge going to them – paying them off in full, automatically each month, of course. 2. If an old card has an annual fee I would call and ask to downgrade the card to a card in the issuer’s offerings that doesn’t have an annual fee. For instance, I had a Citi AAdvantage Platiunum card from Citi and I downgraded that one to the Bronze card, which isn’t really publicized. 3. For newer cards (1-5 years old) I call and cancel the card and ask to have the credit balance transferred to another card I have at that issuer – one that I’m keeping. Alternatively, if the card was the only card that I had from that issuer and I wanted to maintain some perk (free bags) I would probably downgrade the card. The bottom line: get rid of fees or unwanted cards while maintaining history and credit limits. It’s possible you may be unsure about what rewards your cards provide? A new tool I discovered that will help you analyze what rewards you have and where to use your cards for maximum value is Birch Finance. They won the FinTech competition at FinCon last year. They are in beta at the time of this article, but you can still sign up and check them out. Once you’ve played out these decisions on paper, it’s time to call the issuers (using the number on the back of the card) and take action. Proceed with the plan, but consider the suggestions of the agent on the line. They may be willing to waive annual fees (allowing you to keep a card around just a bit longer) or they may know of an undisclosed downgrade option. They also may be aware of other accounts you have with them that you might not have picked up on during your inventory. Highlights include canceling all of our airline cards (Southwest, American Airlines, and British Airways) in part so we can reapply for the Companion Pass soon, canceling a couple of hotel brand cards, and canceling one of our oldest cards: a store card from Pottery Barn (that was long overdue). Auditing your cards allows you to identify gaps in your strategy, opportunities for more rewards, and the act of simplifying just clears your head to be able to take on more credit. My first move was to add another business card. The Chase INK Business Preferred is a card that pays 3 points per $1 spent on internet advertising. I’m spending a lot more with Facebook ads these days thanks to my FinCon business, so this was a no-brainer. Additionally, I’ll be adding another hotel card to the wallet soon. Finally, I’m considering a card that rewards us more for our restaurant spending. The Savor card from Capital One is looking nice with a 3% reward there. Once you’ve got your new suite of cards established, what’s the best way to keep them organized in your wallet? Here’s a picture of my wallet. I keep it pretty simple. Personal cards on the right. Business cards on the left. I have six slots and I keep my associated business debit cards behind the credit cards. Older cards are kept in a safe. 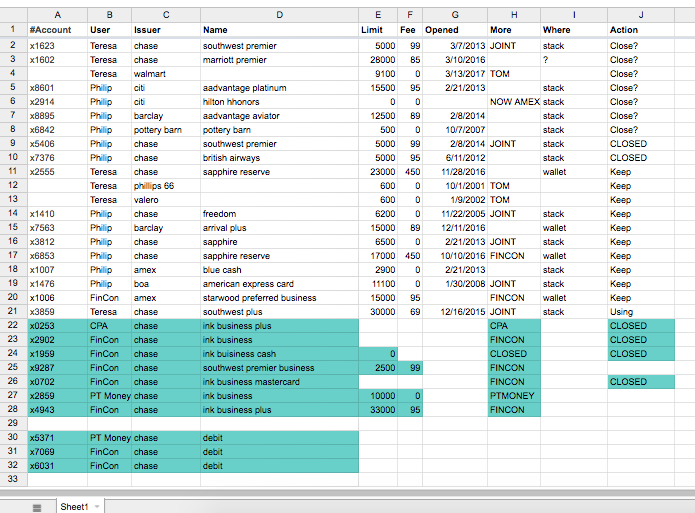 So that’s how I recently organized my credit cards using a simple tracking spreadsheet. What is your strategy for keeping your cards organized? What do you think about my decision-making process? How would you do things differently?